Richard joined the Survey at the start of the field season in July, 2005 and has been field mapping with the STATEMAP Program since that time. STATEMAP is a USGS cooperative grants program that is used to map the surface geology of selected areas in each state at the 1:24,000 scale. Many of the areas chosen in Arkansas were originally mapped by aerial photography, so this is the first time they have been mapped on the ground. Richardâ€™s first field season was spent assisting Angela Chandler on the Treat, Simpson, and Solo quadrangles. The next year, he mapped the Witts Springs, Tilly, and Lost Corner quads with Dan Smith. The following year, Richard moved to a permanent staff position and began leading the field team. The 2007-2009 seasons were spent mapping the Marshall, Harriet, Landis, Canaan, Leslie, and Oxley quads with Erin Smart. From 2009-2014, mapping continued with the help of Daniel Rains. Together they mapped the Alread, Botkinburg, Old Lexington, Rex, Scotland, Clinton, Sylamore, Fox, Mountain View, Mountain View SW, Shirley, and Fairfield Bay quads. This year will be spent on the Prim, Parma, and Greers Ferry, leaving only the Brownsville to complete the entire 1:100,000-scale Mountain View 1 x 2 degree quad. A compilation map will be published when this is done. Also, Richard has been helping with additional terrace mapping along the Buffalo National River, with the goal of publishing a compilation of all the maps along the river corridor in cooperation with the USGS. 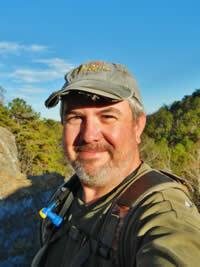 Recently, Richard became registered in the State of Arkansas as a Professional Geologist. When not in the field, he resides with his wife and three daughters in Little Rock.